Papplewick Pumping Station from across the cooling pond (photograph © Martine Hamilton Knight). 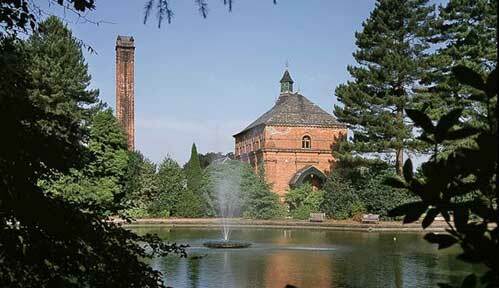 Papplewick pumping station is Britain’s finest working Victorian water pumping station. The site has recently undergone extensive restoration and once again stands proud as a spectacular example of Victorian craftsmanship. Papplewick was designed to pump millions of gallons of clean fresh water everyday to the rapidly increasing population of industrial Nottingham. In the early 19th century, water for drinking, washing and industry still came directly from rivers, wells and springs. Nottingham’s rivers were also open sewers carrying deadly diseases like cholera and typhoid. However it was not until the 1850s that dirty water was linked with these deadly diseases. There was an inefficient water supply to the town and many of the water pumps were broken or damaged and did not provide safe clean water. Pumping stations like Papplewick helped change these conditions by making clean filtered water available. Nottingham had always had a plentiful supply of water; the rivers Trent and Leen had originally been relatively pure streams and there were numerous wells and springs around the town. The (Old) Nottingham Waterworks was established in 1696 taking water from the river Leen to a small reservoir on Park Row where it was dispensed through pipes to various parts of the town. The growth of Nottingham in the period 1720 and 1830 was restricted to the old medieval town boundaries and the supply of water from the Leen became inadequate as well as dangerous as the river was also used as the main sewer for the town. Both industrial and domestic waste was tipped into the river from Mansfield through Nottingham. To meet the growing demand for clean water new supply companies were formed. Possibly the purest water came from Zion Hill, now Canning Circus, where water was drawn from two wells near Alfreton Road using a steam engine and delivered manually by water carriers or ‘higglers’. The number of recipients of this water, however, was limited. The Nottingham New Waterworks Company was formed in 1824 at the top of North Sherwood Street and water was pumped from a well and supplied the north-eastern area of the town. The Nottingham Trent Waterworks Company was set up in 1826 but for various reasons the construction of the Trent Works was delayed until 1830 and was finally completed in 1831. It was located near to the present Casa public house on Trent Bridge and was the first in the country to provide a supply at constant high pressure. Water was taken from gravel beds and through brick filter tunnels into a storage reservoir and pumped through a 15 inch cast-iron water main, part of which remains in service today, to a reservoir on Park Row and the Ropewalk. The improvements made to the supply of water in the town were the work of Thomas Hawksley, chief engineer to the Nottingham Waterworks Company. At the age of 23 years in 1830, he undertook the construction of the new waterworks. He was later to become internationally renowned as a water engineer. In 1845, the three water companies – The New Waterworks, the Old Waterworks, and the Trent, were amalgamated under the direction of Hawksley. He not only improved the supply but reduced the cost to the consumer and improved the lot of the working man and woman when sanitary conditions reached an all time low in the poorer, lower-lying areas of Nottingham. The new company built three pumping stations; Park Works (1850), Bagthorpe (Basford) opened in 1857 and improved in 1868 and Bestwood in 1871. The Park works closed in 1895 although the engine house still stands at the Derby Road end of the Ropewalk. The Basford, Bestwood and all subsequent sandstone sources remain in use today. Much secrecy surrounded the water enterprise in Nottingham. When Dr Edward Seaton became Nottingham’s first Medical Officer of Health in 1873 he was unable to find out the actual distribution of water in the town because the information was a closely guarded secret known only to the engineer of the Nottingham Waterworks and Seaton was denied access to it! Seaton’s directive was to abandon all well water and use only the water provided by the Water Committee. There seems to have been an improvement henceforward and Seaton’s successor, Arthur Whitelegge, (1884) reported, “Nottingham now has an abundant supply of pure water”. Water was stored in the Park Row reservoir, together with a further four built by the Company at Belle Vue; Mapperley Hill, Red Hill and Papplewick. In 1880 the Nottingham Corporation Waster Department took control of all the water companies in Nottingham. Their chief engineer, M. Ogle Tarbotton immediately submitted a report drawing attention to the urgent need for increased production and storage capacity. The result was the construction of the Papplewick pumping station and a second reservoir at Mapperley, brought into operation in 1884. As a result all the other works became redundant. Construction materials for the buildings were brought by horse and cart, and there was no electricity available until 1922. The station began pumping in earnest on 18th September 1884, with number 1 engine being successfully started and number 2 engine about six weeks afterwards. Papplewick had two wells 202 feet deep connected by horizontal shafts 271 feet long. The stone commemorating the opening of the Papplewick reservoir now stands in the station grounds. The reservoir itself had a short operational life being taken out of use in 1906 due to colliery subsidence. In its heyday there were gardeners who maintained the parked landscape; greenhouses producing vegetables for the workers; the constant to-ing and fro-ing of horse drawn carts bringing coal up the cobbled drive as well as the noise and vibration of the pumps working at full capacity. The style and elegance of the interior of the engine house is an architectural statement of water supply and purity and civic pride of the Victorian period. In 1898 the Nottingham Corporation Water Department were given their own premises, the Castle Works at the junction of Castle Road and Lenton (later Castle) Boulevard. In 1899, Nottingham joined with Leicester, Sheffield and Derby to form the Derwent Valley Water Board to act as a bulk supply authority using water from three specially constructed reservoirs, Howden, Derwent and Ladybower. The location of Papplewick meant that there was the ever present threat of subsidence caused by local colliery workings and various undertakings with the Coal Board staved off any great problems. The station continued to work throughout the first four decades of the twentieth century, although there were numerous difficulties either with staff or the engines. The early post-war years saw more problems arise and it seemed that for considerable number of years it was a case of repair and mend to keep the station functioning and the premises in good order. The final major development at Papplewick was in 1967 for the electrification of the engine at a sum of £50,000. Shortly after the electrification it was suggested that the Pumping Station be scheduled as an industrial monument under the Ancient Monuments Act. This was the start of a long running saga which rumbled on for many years and finally culminated its restoration in and re-opening in June 2005. The station is now run by a trust and is open to the public at various times throughout the year. Special steaming days are organised, when it is possible to see the original boilers and beam engines at work. Restoration projects and many aspects of day to day operations at the station , including steaming events are made possible by a group of dedicated volunteers, known as the Papplewick Association. They welcome new members and offer a wide variety of activities suitable for people with all kinds of interests and skills. Papplewick Pumping Station Trust (Registered Charity 1097618) has been fortunate in attracting grants from the landfill tax scheme (Biffaward) and the Heritage Lottery Fund towards the major restoration project. Other organisations which have contributed to this restoration are English Heritage, Severn Trent Water and the Greater Nottingham Partnership. Information contained in this entry courtesy of Brian Loughbrough, Ken Brand and Miriam Tong. Thanks to Martine Hamilton-Knight for the use of photographs.